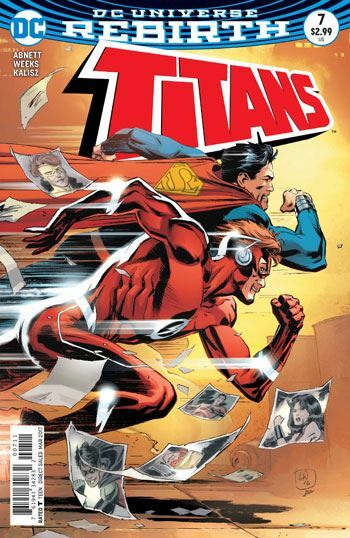 After six issues of the Wally West comic, Titans finally starts to deal with the Titans, and it does a great job of it, too. Abnett stays on scripting, but the art has been passed to Lee Weeks, who does a very good job with it. 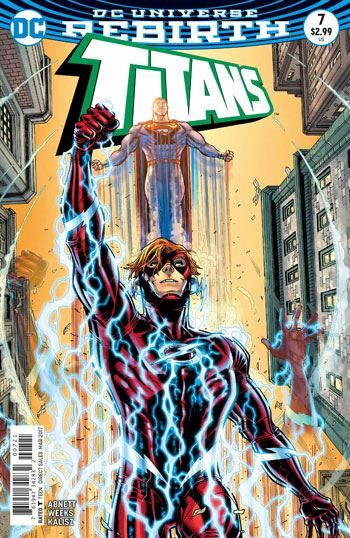 The story has all the great hallmarks of what we need in a Titans comic. Young adults still striving to find their way in the world. A familiar villain. A familiar looking headquarters. Discussions in a diner. A budding romance between Donna Troy and Roy Harper. I probably could have done without the promise of opening up the “Who is Donna Troy” mystery for the twentieth time. I might be exaggerating with that number. I might not. I’m not inclined to go back and count them all. Surprisingly, though there is a big urban fight scene, a Superman/Flash race, and some discussion that touches on Rebirth, my favourite scene in the story had to do with filling out forms. Sound dull, doesn’t it? Abnett turns procedural paperwork into comic gold for a few pages. Wally West is amazed when Superman knows who he is. That’s because this is the pre-New 52 Superman, so he knows Wally, and even knows of his relationship with Linda Park. This is precisely the person that Wally needed to talk to, at the right moment. Superman is able to confirm Wally’s feelings that their reality is being altered, and yet neither fully understand what is going on. I was also really pleased to see Mal and Karen Duncan back in the book. They were an important part of Titans Hunt, and were all but left out of the first story arc here. That looks to be changing, big time.